Scripps Center for Dental Care boasts a multi-specialty band of extensively trained professionals from all major fields of dentistry. This modern approach to health and oral care demands an equally modern approach to digital marketing, so Dr. John F. Weston and Dr. Nick Marongiu reached out to Rosemont Media to upgrade their aging practice site. During the planning phase, the La Jolla dentists had a few specific requests to include: use photos of real patients, provide convenient access to forms, include video testimonials, and highlight the in-house multidisciplinary team. The result is a sophisticated and aesthetically appealing reboot that reflects the high standards for which Scripps Center for Dental Care is known. Behind the scenes, Rosemont Media also updated the SEO strategies to help place the site high on Google, Bing, and Yahoo search result pages, making it easier than ever for current and prospective patients to locate the website. The responsive design, a must-have for contemporary sites, ensures the browsing experience is as effortless on a smartphone or tablet as a traditional computer. This winning combination of innovative features sets the practice apart from its competition and serves as a siren song to patients of all ages in the San Diego area. Is your website showing signs of aging? 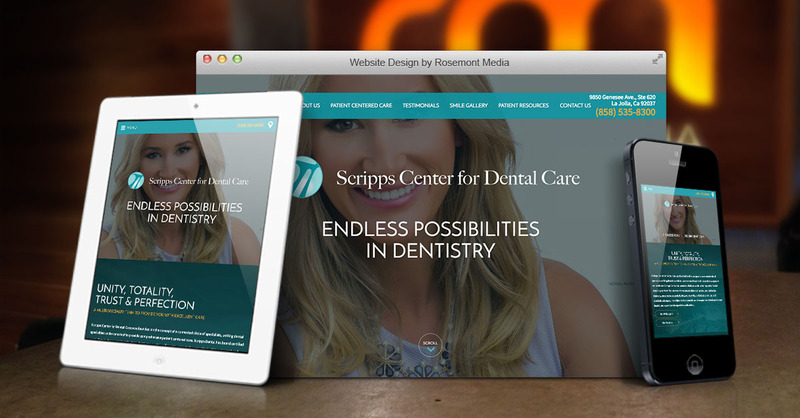 Check out www.scrippsdentalcare.com to see how Rosemont Media can bring you into the current era of marketing.